Now that old man winter is finally ready to give way to the tulips going into bloom to herald spring and summer, young women (and men) get set to graduate from schools and colleges. This involves getting dressed and groomed to look their very best, including the shoes they purchase. This blog is dedicated to my female audience with whom I want to share some pointers as to how to make the right decision while purchasing new shoes for these momentous occasion as well as how to choose proper shoes for everyday life. Majority of women prefer to use high-heeled shoes while going out for any formal event or for a night out with friends and family. High-heeled shoes can cause pain, deformities, and damage to the feet that can remain problematic for years to come. To prevent these from happening try to avoid shoes that are narrow and pointy in the front. Choosing heels less than 2 inches can also go a long way. 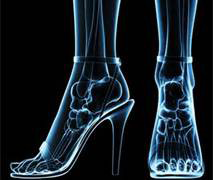 High-heeled shoes transfer excessive pressure to the forefoot which can disrupt the body’s alignment and can lead to conditions such as bunions, hammertoes, corns & calluses, neuromas, Haglund’s deformity (aka “pump bump”), ankle sprain, and back pain from chronic use. High heels can also cause an instability while walking on uneven and/or slippery surfaces leading falls which can cause sprains/strains/fractures of the foot and ankle. If a heel higher than 2 inches must be used, make sure that the heel of the shoe sits more or less directly under the heel counter (where the heel of your foot would sit inside the shoe—refer to diagram) and not anterior (front) of it. That way the center of gravity will not be violated. However, recommendation of heel height not to exceed 2 inches still stands. Also make sure that you have enough room in the toe box and ensure that the shoe is appropriate in width. Buy any shoes at the end of the day to allow for natural swelling to be a factor while choosing the appropriate width of the shoe. Wishing all of you a very happy prom/graduation season and remember healthy feet are happy feet and happy feet make happier people.